In late 1839, Lincoln and some other Springfield bachelors wrote her a letter asking for her help in organizing a ball. As the presidential campaign between President Martin Van Buren and William Henry Harrison progressed, so did the relationship between Abraham Lincoln and Mary Todd. Historian William C. Harris wrote: “After returning home from campaigning, Lincoln realized that he had made a mistake by encouraging Mary to believe a romantic attachment existed. However, he hesitated to tell her this.”31 On the “fatal first” of January 1841, Lincoln broke off their relationship/engagement. Mary’s relationship with Commissioner of Buildings William Wood was conspicuously controversial. Historian Michael Burlingame wrote: “David Davis, who found the appointments of Wood ‘incomprehensible,’ was told by the president that ‘it would be ruinous to appoint him – ruinous to him.” Burlingame wrote: “Lincoln finally agreed to appoint Wood only after the First Lady shut herself in her room” – a tactic that Burlingame reported she repeatedly used to get her way.” 48 With Wood, she planned the redecoration of the White House with trips to New York and Philadelphia for purchases. Lincoln scholar Daniel Mark Epstein wrote: “While her husband was consumed by urgent political and military business, Mrs. Lincoln was becoming enmeshed in the world of Washington influence peddling and intrigue, flattery and treachery. It is a world that no one can truly comprehend, because the rules of the game played there have never been agreed upon. She thought that William Wood had become indispensable to her, although he was both dishonest an dull-witted. She would turn against him in early September.” Upset about spending and reports of corruption and bribes, Lincoln fired Wood in early September. Mrs. Lincoln’s trips to New York had another downside. She became seriously addicted to shopping. Lincoln writer Jerrold M. Packard wrote: “Mary particularly homed in on the great mercantile emporium of Alexander T. Stewart, a shopping palace many considered the finest department store in the world and a destination where the first lady anticipated every success in having her needs met. One of her biggest purchases at Stewart’s was a $2,500 carpet meant to replace the East Room’s threadbare predecessor.” 54 Mrs. Lincoln’s shopping had serious financial, legal and emotional consequences for the First Lady, who had to deal with threatened lawsuits by merchants like A.T. Stewart. Cousin Elizabeth Todd Grimsley recalled a trip in the late summer of 1861: “Our next trip to New York was after the called [congressional] session, and an appropriation had been made for re-furnishing a few of the bed rooms, and this time we did not escape the reporters so well, for we could not step in or out of a carriage without one of that fraternity being at our elbow, and various were the devices made to escape recognition. As is well know, Mrs. Lincoln was fond of dress, had fine taste, and her husband enjoyed seeing her in full dress, but she did not indulge in the one hundredth part of the extravagance with which she and I were credited, on that occasion. When she bought the dinner set for the Executive Mansion, she ordered a set made for herself, with her initial, and this latter, I know, was not paid for by the district commissioner, as was most unkindly charged when it was stored away. Unfortunately, too many presents, were sent marked ‘personal gifts’, and were accepted, but Mr. Lincoln was not in this respect ‘worldly wise’ and Mrs. Lincoln could not anticipate the storm of censure which fell upon her. Mrs. Lincoln’s trips to New York were sometimes linked to her sons. She first visited Robert Todd Lincoln in Boston in mid-May 1861. In the July of 1861, she and Tad met Robert at the Metropolitan Hotel. Robert and his mother returned to the hotel for several days in mid-August – before Robert began the fall session at Harvard. Mary and son Tad again left Washington on October 20, 1862 for New York City. She went on from there to visit her older son Robert in Cambridge, returning to the White House about a month after she left. Robert was himself in New York City when he received word of his mother serious injury in a carriage accident. The President wired him: “Come to Washington.” 58 She went to July in August 1863 after she recovered from a carriage accident – and then proceeded north to New England to escape the summer hear in the nation’s capital. In June 1864, Robert again joined his mother in New York City, accompanying her back to Washington before returning to Harvard for his graduation ceremony. The last three years of her husband’s presidency after the death of beloved son Willie in February 1862 were difficult for Mrs. Lincoln. Willie’s death led to the social retirement of Mrs. Lincoln, which led in turn to a temporary resurgence of her husband’s popularity. 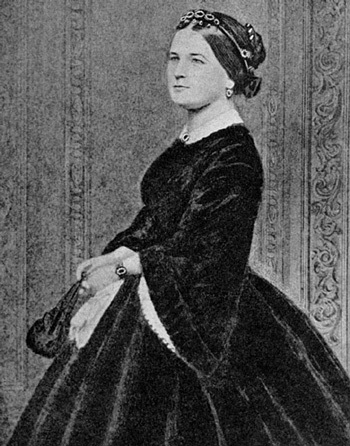 “Since the death of his boy led Mrs Abe into retirement, there has been nothing to diminish the public trust and attachment,” wrote Charles A. Dana.” 61 Historian Matthew Pinsker wrote: “Frustrated by her private grief and poor health, nineteenth-century gender conventions, and her husband’s near-constant state of exhaustion, the First Lady found it difficult to connect to him and to support him in his enormous endeavors.” 62 She easily alienated presidential aides John G. Nicolay and John Hay, who nicknamed her the hell-cat for her aggravating demands. When presidential aide William Stoddard was preparing to leave the White House for Arkansas in September 1864, John Hay told John G. Nicolay: “John! What’ll we do with the Madame after Stod goes? Heaven! You and I can’t manage her.” 63 Stoddard was the only one who could. Women were frequent visitors to the presidential office – generally to seek favors for relatives in the Union Army. But there were also women who came to discuss policy issues like emancipation like novelist Harriet Beecher Stowe or abolitionist Anna Dickinson or religious concerns like Quaker Eliza Paul Kirkbridge. Cordelia Perrine Harvey, the widow of a Wisconsin governor, repeatedly sought better treatment for convalescing Union soldiers. President Lincoln was generally polite but direct – with the conspicuous exception of a midnight meeting in September 1861 with Jessie Benton Frémont, who came to the White House brusquely to represent the interests of her husband, General John Frémont. Mr. Lincoln was equally brusque. Chicago civil activist Mary Livermore came to the White House to seek help for the U.S. Sanitary Commission. She first visited the White House in December 1862 and was shocked by the president’s appearance and his pessimism. In 1865, she sought help for a fund-raising fair in Chicago. Livermore recalled: “From the first public announcement of this fair, President Lincoln took a lively interest in it. He bore testimony again and again to its moral influence, and inquired concerning its progress of every visitant from the Northwest that found his way to the White House. We wrote with much hesitation – for we never forgot how he was shouldering the woes and cares of the country – asking for some contribution from himself to our fair. The people of the Northwest were idolatrously attached to him; and we knew that any gift from him would be prized above all price. So we urged our petition as earnestly as we knew how, and enlisted Hon. Isaac N. Arnold, of Chicago, a personal friend of Mr. Lincoln, to send our prayers in person. In contrast, Mary Todd Lincoln was fond her cousin Elizabeth Grimsley: “She is a noble, good woman & has been purified, through much trial.” 79 Also fond was President Lincoln. When Elizabeth returned to Springfield in the fall of 1862, President Lincoln “put his arm around me with a fervent ‘God bless you, my cousin'” and “wrung my hand and watched me as I descended the stairs, where found all the servants and messengers congregated to bid me ‘farewell. '” 80 Both Mr. and Mrs. Lincoln were also fond of Emilie Todd Helm, Mary’s younger half sister whose husband, Confederate General Benjamin Hardin Helm was killed in Battle of Chickamauga in September 1863 . On December 13, 1863 John Hay recorded that Mrs. Helm “just arrived from Secessia.” Such visits by Emilie naturally were controversial among Radical Republicans in Washington. It would take Mrs. Lincoln more than a month to compose herself , pack and leave the White House.”The shock of her husband’s death had brought about a nervous disorder [for Mary Todd Lincoln]. Her physician, Doctor Stone, refused to allow her to be moved [from the White House] until she was somewhat restored,” recalled security guard William Crook.88 “At about five o’clock [on May 22, 1865], Mrs. Lincoln, Robert, Tad, and Lizzie [Keckley] walked down the public stairway, entered a horse-drawn carriage driven by the husband of Rosetta Wells, one of the women in the White House who had mended linens and torn clothing, wrote Keckley biographer Becky Rutberg.. “Dr. Anson Henry, Mrs. Lincoln’s friend and personal physician, and two White House guards joined them in a green railroad car that had been chartered for their use.”89 Other than seamstress Keckley, notably absent were any female friends of the former First Lady. H. Donald Winkler, The Women in Lincoln’s Life, p. 53. See Benjamin Thomas, Lincoln’s New Salem,. Michael Burlingame, Abraham Lincoln: A Life, Volume I, p. 60. David Herbert Donald, “We Are Lincoln Men” Abraham Lincoln and His Friends, p. 19. H. Donald Winkler, The Women in Lincoln’s Life, p. 59. Emanuel Hertz, editor, The Hidden Lincoln, p. 76. George Anastaplo, Abraham Lincoln: A Constitutional Biography, p. 130. Frank J. Williams, Judging Lincoln, p. 32. Walter B. Stevens, (edited by Michael Burlingame), A Reporter’s Lincoln, p. 7. Douglas Wilson, Honor’s Voice, p. 110. H. Donald Winkler, The Women in Lincoln’s Life, pp. 94-95. Jesse W. Weik, The Real Lincoln: A Portrait, p. 70. Jesse W. Weik, The Real Lincoln: A Portrait, pp. 72-73. H. Donald Winkler, The Women in Lincoln’s Life, p. 75. H. Donald Winkler, The Women in Lincoln’s Life, p. 46. H. Donald Winkler, The Women in Lincoln’s Life, pp. 71, 96, 91. William E. Barton, Life of Abraham Lincoln, Volume I, p. 224. Walter B. Stevens, (edited by Michael Burlingame), A Reporter’s Lincoln, p. 10. Harvey Lee Ross, The Early Pioneers and Pioneer Events of the State of Illinois, p. 102-103. Douglas Wilson, Honor’s Voice, p. 112. CWAL,, Volume IV, p. 310 (Memorandum, ca. April 1, 1861). Douglas L. Wilson and Rodney O. Davis, editors, Herndon’s Informants: Letters, Interviews and Statements about Abraham Lincoln, p. 601 (Letter from Nancy G. Vineyard to Jesse W. Weik, February 4, 1887). Douglas L. Wilson and Rodney O. Davis, editors, Herndon’s Informants: Letters, Interviews and Statements about Abraham Lincoln, p. 263. Jesse W. Weik, The Real Lincoln: A Portrait, p. 65. Emanuel Hertz, editor, The Hidden Lincoln, p. 112 (Letter from William H. Herndon to James W. Weik, September 23, 1885). Matthew Pinsker, Lincoln’s Sanctuary: Abraham Lincoln and the Soldier’s Home, p. 29. David Herbert Donald, “We Are Lincoln Men” Abraham Lincoln and His Friends, p. 104. Stephen Berry, House of Abraham: Lincoln & The Todds, A Family Divided by War, p. 29. Stephen Berry, House of Abraham: Lincoln & The Todds, A Family Divided by War, p. 31. Michael Burlingame, editor, A Reporter’s Lincoln, p. 114. William C. Harris, Lincoln’s Rise to the Presidency, p. 24. H. Donald Winkler, The Women in Lincoln’s Life, p. 117. Jesse W. Weik, The Real Lincoln: A Portrait, p. 64. Brian Lamb and Susan Swain, editors, Abraham Lincoln: Great American Historians on Our Sixteenth President, p. 26. Michael Burlingame, Abraham Lincoln: A Life, Volume I, pp. 198, 202, 224. Michael Burlingame, Abraham Lincoln: A Life, Volume I, pp. 222, 175. Willard L. King, Lincoln’s Manager: David Davis, p. 57. Brian Lamb and Susan Swain, editors, Abraham Lincoln: Great American Historians on Our Sixteenth President, p. 5. Douglas L. Wilson and Rodney O. Davis, editors, Herndon’s Informants: Letters, Interviews, and Statements about Abraham Lincoln, p. 491 (Charles S. Zane statement, ca. 1865-1866). Ronald C. White Jr., A. Lincoln, p. 341. Harold Holzer, Lincoln President-Elect: Abraham Lincoln and the Great Secession Winter 1860-1861, p. 436. Michael Burlingame, Abraham Lincoln: A Life, ,Volume II, p. 263. Stephen Berry, House of Abraham: Lincoln & The Todds, A Family Divided by War, p. 101. Joan A. Lemp, “Vinnie Ream and Abraham Lincoln”, Women’s Art Journal, Fall 1985, p. 25. William Howard Russell, North and South, p. 78. Catherine Clinton, “Wife Versus Widow: Clashing Perspectives on Mary Lincoln’s Legacy”, Journal of the Abraham Lincoln Association, Winter 2007, p. 15. “Lincoln’s First Levee”, Journal of the Illinois State Historical Association, October 1918, p. 388-389. Michael Burlingame, Abraham Lincoln: A Life , Volume II, pp. 266-267. Daniel Mark Epstein, The Lincolns: Portrait of a Marriage, pp. 338 ,341. Daniel Mark Epstein, Lincoln’s Men, p 95. Michael Burlingame, Abraham Lincoln: A Life, Volume II, p. 251-252. Robert J. Havlik, “Lincoln’s Washington Carriages Revisited”, Lincoln Herald, Fall 2010, p. 166. Justin G. Turner and Linda Levitt Turner, editors, Mary Todd Lincoln: Her Life and Letters, p. 201 (Letter from Mary Todd Lincoln to Abram Wakeman, February 18, 1865). Jerrold M. Packard, The Lincolns in the White House: Four Years That Shattered a Family, p. 53. Elizabeth Todd Grimsley, “Six Months in The White House”, Journal of the Illinois State Historical Society, Vol. XIX, October 1926, January 1927, p. 59. Mary Clemmer Ames, Ten Years in Washington – Life and Scenes in the National Capital – as a Woman Sees Them, p. 237. Edward K. Spann, Gotham at War: New York City, 1860-1865, p. 78. CWAL, Volume VI, p. 323. (Telegram to Robert Todd Lincoln, July 11, 1863). Justin G. Turner and Linda Levitt Turner, editors, Mary Todd Lincoln: Her Life and Letters, p. 106 (Letter from Mary Todd Lincoln to Elizabeth Todd Grimsley, September 29, 1861). Anna Boyden, editor, War Reminiscences: A Record of Mrs. Rebecca R. Pomroy’s Experience in Wartimes, pp. 78-79. Michael Burlingame, Abraham Lincoln: A Life, Volume II, p. 311. John Y. Simon, Harold Holzer, and Dawn Vogel, editors, Lincoln Revisited, p. 88-89 (Matthew Pinsker, “Abraham Lincoln and the Soldiers’ Home”). Harold Holzer, Lincoln’s White House Secretary: The Adventurous Life of William O. Stoddard, p. 339. Francis Fisher Browne, The Every-day Life of Abraham Lincoln, pp. 516-517. Nell Irvin Painter, Sojourner Truth: A Life, A Symbol, pp. 203-204. Jacqueline Bernard, Journey Toward Freedom: The Story of Sojourner Truth, p. 202. Nell Irvin Painter, Sojourner Truth: A Life, A Symbol, p. 207. Mary A. Livermore, My Story of the War: Four Years Personal Experience in The Sanitary Service of the Rebellion, p. 579. Mary A. Livermore, My Story of the War: Four Years Personal Experience in The Sanitary Service of the Rebellion, p. 580-581. H. Donald Winkler, The Women in Lincoln’s Life, p. 169. Princess Felix Salm-Salm, Ten Years of My Life, p.45. Princess Felix Salm-Salm, Ten Years of My Life, p. 44. Elizabeth Smith Brownstein, Lincoln’s Other White House, p. 217. Fanny Seward Diary, p. 360. Doris Kearns Goodwin, Team of Rivals: The Political Genius of Abraham Lincoln, p. 155. Michael Burlingame, Abraham Lincoln: A Life,, Volume II, p. 55. Daniel Mark Epstein, The Lincolns: Portrait of a Marriage, p. 459. Douglas L. Wilson and Rodney O. Davis, editors, Herndon’s Informants, p. 444 (Interview with Elizabeth Todd Edwards, ca 1865-1866). Michael Burlingame, Abraham Lincoln: A Life,Volume I, p. 180. Justin G. Turner and Linda Levitt Turner, editors, Mary Todd Lincoln: Her Life and Letters, p. 187 (Letter from Mary Todd Lincoln to Mercy Levering , November 19, 1864). Elizabeth Todd Grimsley, “Six Months in the White House”, Journal of the Illinois State Historical Society, Vol. XIX, October 1926, January 1927, p. 73. Stephen Berry, House of Abraham: Lincoln & The Todds, A Family Divided by War, pp. 157-162. Michael Burlingame, Abraham Lincoln: A Life, Volume I, p. 179. John S. Barnes, “With Lincoln from Washington to Richmond in 1865”, Appleton’s Magazine, May 1907, p. 743. C. A. Tripp, The Intimate World of Abraham Lincoln, pp. 172-173. John Y. Simon, editor, The Personal Memoirs of Julia Dent Grant, pp. 146-147. Margaret Leech, Reveille in Washington, p. 301. Billy J. Harbin, “Laura Keene at the Lincoln Assassination”, Educational Theater Journal, March 1966, p. 47. Becky Rutberg, Mary Lincoln’s Dressmaker: Elizabeth Keckley’s Remarkable Rise from Slave to White House Confidante, p. 113.